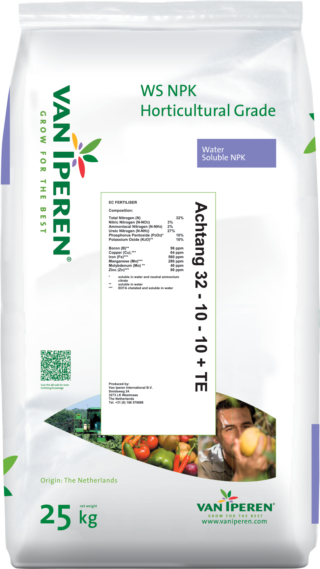 Van Iperen Achtang | 32 - 10 - 10 + TE is a pure WS NPK with a high level of Nitrogen combined with EDTA chelated Micronutrients. Our product has a limited caking sensitivity and is recommended during periods of vegetative growth. The high level of Nitrogen in our formula improves cell elongation and contributes to the production of protein, supporting enzymatic reactions. The presence of Micronutrients supports general plant metabolism. Compatible with other fertilizers, with the exception of Calcium fertilizers. Therefore a separate tank is needed or fertilizers should be applied on different times. The pH of the tank solution should be above 4. Our sister company Transterminal Dordrecht (TTD) is one of the three largest Water Soluble NPK production facilities in Europe. 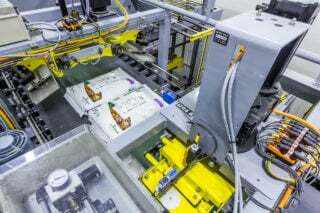 This is where we produce our high quality and innovative WS NPKs thanks to the completely automated blending and packing line and an experienced staff.